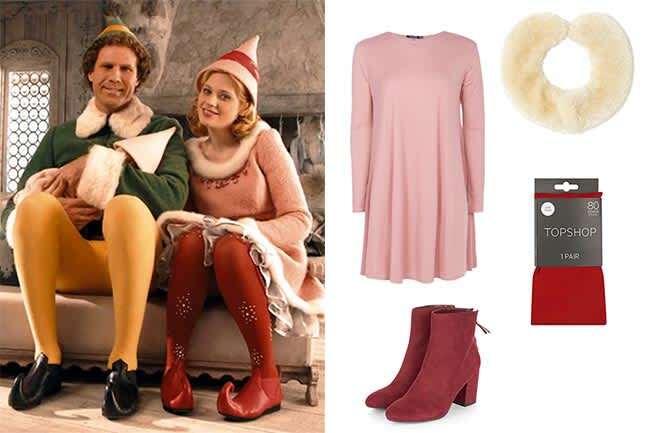 Christmas style: Festive fashion inspiration from the characters | HELLO! Bringing a touch of Californian cool to the English countryside, Cameron Diaz's character Amanda Woods isn't going to let snow dampen her style. Instead she wraps up in a series of covetable coats; think fluffy cream shearling numbers and co-ordinating accessories that we're still trying to recreate a decade later. This River Island cream faux fur trim coat (£80) is a good substitute for Amanda's. Layer up with this H&M striped scarf (£17.99) and Peacocks hat (£5) and you're good to go. Love Zooey Deschanel quirky style as Jovie? It is possible to recreate her look without going full on Elf, just play around with colour blocking and clashing shades such as pink and red. This pink Boohoo swing dress (£12) is cosy and affordable. Take cues from Zooey and pair with red tights (£6, Topshop), this cute Petit Bateau faux fur Peter Pan collar (£18) and suede-effect boots from New Look (£20.99). Juliet from Love Actually's laidback look is easy to emulate at home. Skinny jeans and an off-the-shoulder knit are all you need to recreate her girl next door vibe. The off-the-shoulder top is a major player for AW16. Pair this ASOS jumper (£32) with skinny jeans for Juliet's effortless style. Which Christmas movie character do you think is best dressed?